The other day, I got together with a friend and her daughter to re-take pictures of some veils (you can see some in the French Garden Mantillas). After the photo shoot, we got to talking about the meaning of the veil and nuptial imagery for the love of God. I was just blown away when Rachel, referring to what it's like to receive Holy Communion, said, "It's like getting married over and over and over again." Theologically, receiving Holy Communion is actually more like consummating the marriage, but she really seemed to understand the concept. And this from a 14-year-old! Back at home, I pulled up the photos on my computer and they really took my breath away. 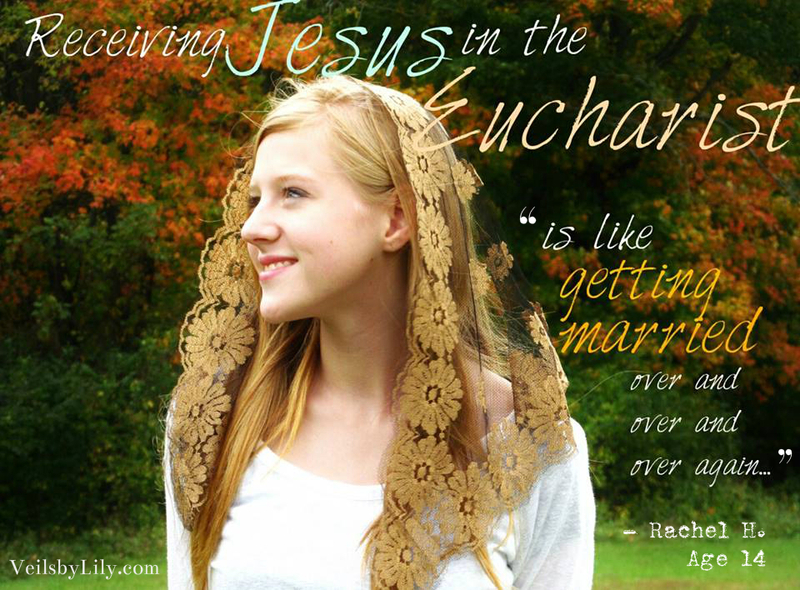 The joy of the love of God was shining through Rachel's face, and her words came right back to me: "It's like getting married over and over and over again." Isn't it so fitting, then, that we who represent the Bride of Christ wear a veil as a sign of loving submission to our Bridegroom? I encourage all of you to think of this the next time you receive Holy Communion. May your Holy Communion be fruitful in inflaming your heart with the Divine Love with which His Own is all on fire!